Back To School - Happy Hundredth, Blugolds! 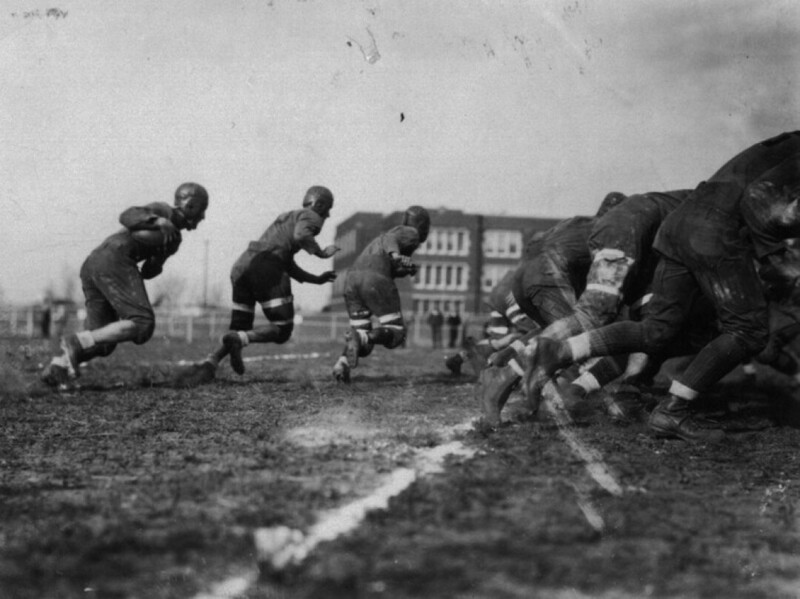 A scene from the 1929 Homecoming Football Game against Stevens Point. Schofield Hall can be seen in the background. In case the name of the newish Centennial Hall and the presence of a giant “1916” sign in the middle of campus didn’t tip you off, UW-Eau Claire had a big birthday coming up. The university turns 100 this year, and several celebrations will mark the historic occasion. To celebrate Homecoming eve, an Alumni Day Reception will be held 4:30-7:30pm Friday, Sept. 30, in the Ojibwe Room of the Davies Center. All Blugold alumni and their guests, as well as current and former UWEC faculty and staff, are invited. There will be mingling, reminiscing, and heavy hors d’oeuvres. Tickets are $5.50 per person and are available at the UWEC Service Center; by calling (715) 836-4636 or (800) 949-8932; or by going to uwec.ticketforce.com. Billed as a “once-a-century event,” this evening will feature UWEC ensembles – including the University Symphony Orchestra, the Concert Choir, Jazz I, the L.E. Phillips String Quartet, and the Wind Symphony – presenting the world premieres of five specially commissioned works. The composers include current and former UWEC music faculty members Ivar Lunde, Ethan Wickman, and Chia-yu Hsu as well as Blugold music alumni Kyle Newmaster and Jordan Jenkins. The gala will be at Haas Fine Arts Center from 6:30 to 9:30pm, but you’ll want to come early so you have time to enjoy complimentary hors d’oeuvres and wine, performances by theater and music students, and a special exhibit of alumni artwork at Foster Gallery. Tickets are $40 each and are available at the UWEC Service Center; by calling (715) 836-4636 or (800) 949-8932; or by going to uwec.ticketforce.com. The first building on campus – once known as Old Main, now called Schofield Hall – was dedicated Oct. 19, 1916. Exactly 100 years later, UWEC will celebrate with a reenactment and a 100-foot birthday cake. Keep an eye on uwec100.com to find out more details about this special event. Check the official anniversary website (uwec100.com) for more events and visit www.uwec.edu/news/upload/CentennialEventsList.pdf for a list that extends through next May and includes the centennial-themed Viennese Ball in April!